© 2013 by Sam Rutter; all rights reserved; content may not be copied, rewritten, or republished without written permission. A Swim spa like the Michael Phelps model is arguably one of the best investments for your familys health, relaxation, and well-being today. It can be considered as a private healing center and a place for complete recreation. Health enthusiasts know the importance of having a prime area at the home for unwinding after a long days work. If you too are looking for a model that offers a unique combination of world-class quality craftsmanship, outstanding therapy, and luxury amenities, it ought to be one endorsed by Michael Phelps. Why Install a Swim Spa in Your Outdoor Living Area? They are splendid additions to your home. They offer a splendid space for a number of fun activities. They are an ideal option for people who want to exercise daily and want to enjoy maximum relaxation and excitement at the same time. All of these benefits are available to an individual when installed in an optimal space. This particular model is a good choice for a particular kind of individual. Notably, one who leads a busy life with limited leisure time to enjoy swimming and other fun activities. You no longer have to go to a health club to enjoy swimming or workouts. You can enjoy all these facilities in the comfort of your home. In this aqueous environment, you can easily enjoy swimming and laze out in your free time. Exercise and swimming in warm water have many major benefits. They have been proved beneficial in the treatment of painful muscles, joints, and the locomotor system. Individuals suffering from arthritis can attain a lot of relief by swimming in one. One of the key features is its strong and adjustable counter-current; this makes it an excellent swimming pool in smaller, limited spaces for swimmers of all ages, levels, and abilities. By installing one in your outdoor space, you can systematically work on your fitness condition or just enjoy free mobility in hot water. You can place your spa in your garden, on a concrete slab, or on reinforced backyard decking. Add a retractable canopy to tweak your current weather condition. This way, you can enjoy a warm soak in any weather and at any time around the year. They offer immense hydrotherapy advantages. You can find out more about them from a number of online resources. 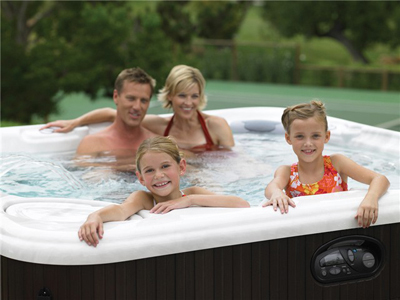 There are several websites on the internet that provide ample information about suppliers of swim spas. Browse through the pages of these websites for further information. Choose the right model according to your needs and budget. While selecting the right swim spa, you must consider one that can be installed properly in your outdoor living area. Do you have any helpful installation or use tips? Share them in the comment section below! This educational piece of content was created by Sam Rutter, guest writer and strategist for Master Spa Parts, a leading source and supplier of the Michael Phelps swim spa and accessories like filters, pumps, parts, circuit boards, jets, spa chemicals, etc.